Hello, hello and happy Wednesday! I am super excited to share more details on a couple of events happening this week, one of which I have been working on with friends. I am honored to contribute to one event and help spread the word about another. The time to #resist in Philly is definitely here, and there are a lot of opportunities to stand up for justice and to educate yourself on how you can help. Post-election the city is full of activism and education, not to say it wasn’t before – but once again it is on the fore front and gaining traction. After the election I mentioned that I would be getting a little more political on here. The reasoning is I am political. I do not hide my beliefs. This doesn’t mean that I don’t want to have conversations with people who think differently, on the contrary I want to talk to as many people as possible that are willing to have a two-sided discussion. I also want to provide as much info as I can for anyone who wants to be more active in the fight for a progressive United States. For those of you in Philadelphia who are sympathetic – The GOP is having a “retreat” at the Loews hotel today and tomorrow. There are plenty of groups going to protest and you can see a collective list here. If that is not an option for you you can wear all black to mourn the loss of the 43,000 lives that are projected to be lost if the ACA is repealed. Share your story on social media using the hashtag #BlackOutForHealthCare. I am super excited to share this event. My friend Margo and I have been working to get this event together since the election. 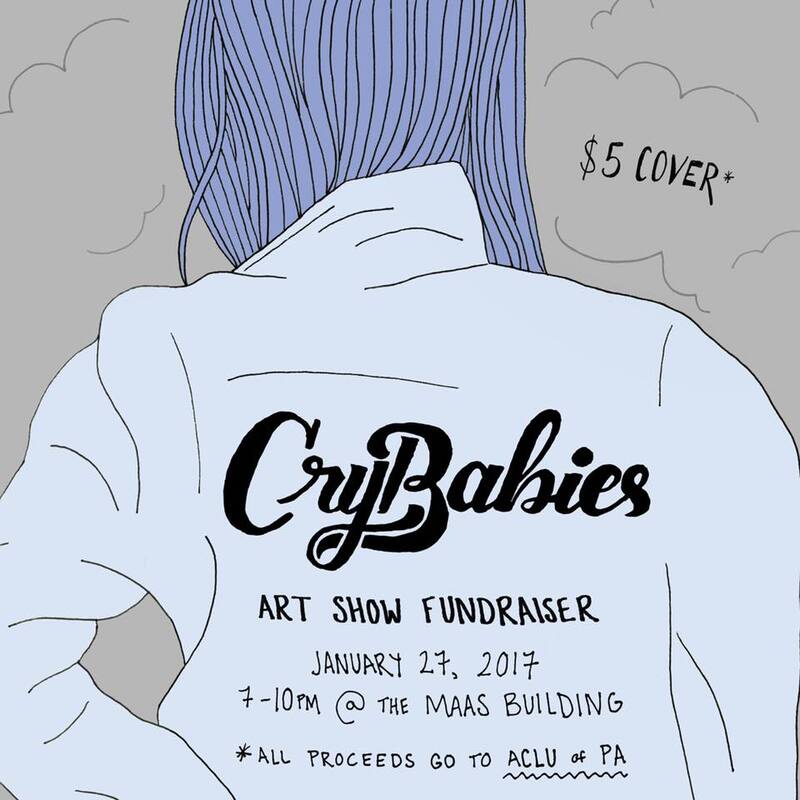 Ten artists & Designers and 3 DJs have put together an awesome show to raise money for an organization who’s advocacy work is going to be vital in the coming years – the ACLU of PA. Along with all the awesome art and tunes, Bai Beverages will be stopping by to give out some of their delicious antioxidant drinks, the Dump-N-Roll food truck will be parked out front, and beer will be available with your $5 admission fee at the door. P.S. Come say hi to me because I will be a nervous wreck, I have never shown my art before. Note: This event or its organizers are not directly affiliated with the ACLU of Pennsylvania, nor has the organization officially endorsed this event. I love hearing how things are on the East Coast! I’m in Nebraska and it’s such a different pace and action with everything happening. It’s so crazy to see how things are. I’m from Colorado originally and have a lot of family in the South and you can definitely tell teh different influences coming into play.
? You go girl! Keep the momentum going! Thank you! We can definitely make a difference. I LOVE all of this. I grew up outside of Philly and can only wish I would be home to see this. I’d be there to support you in a second if I could. Thank you!! It was amazing to see the support at the event, I am so happy to say we raised over $1000 for the ACLU! !